25th December 1642. Woolsthorpe, Lincolnshire, England. Isaac Newton was the son of Isaac and Hannah Newton of Woolsthorpe. His father died three month’s before his birth. King’s School, Grantham. Trinity College, Cambridge. 1646: His mother Hannah marries the 63 year old Rector from North Witham, Barnabas Smith. Hannah leaves to live with Smith and leaves young Newton in the care of her mother. 1653: Death of Barnabas Smith. Hannah moves back to Woolsthorpe a fairly wealthy woman. 1655: Newton goes to live with the apothecary Mr Clarke so that he can attend Grantham Grammar School. 1659: He returns home to his mother. 1660: Newton returns to Grantham School and lives with the Headmaster John Stokes. 1661: He moves up to Cambridge University. 1664: Newton is elected as a Scholar at Trinity. Moves temporarily back to Woolsthorpe to escape the plague then in Cambridge. He continues with his mathematical work. 1665: He contemplates the falling of an apple in his garden which leads him to formulate his theories of gravitation. 1667: Newton returns to Cambridge. Elected Minor Fellow of Trinity College. 1668: Newton is elected as a Major Fellow of Trinity College and granted his Master’s Degree. 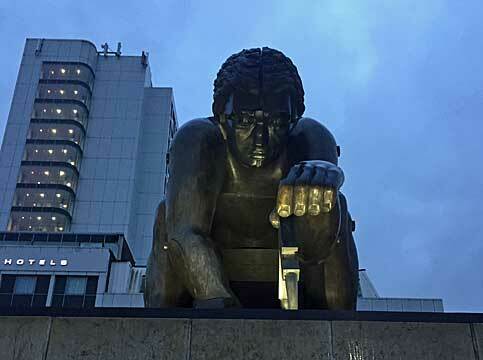 (August) Makes his first visit to London. 1669: Newton describes his reflecting telescope in a letter to Henry Oldenburg the first Secretary of the Royal Society in London. (October) Created the Lucasian Professor of Mathematics. (November) On his second visit to London he meets John Collins who was to give great support to his mathematical endeavours. 1670: He gives the first of his lectures on optics. 1671: The Newtonian Reflecting Telescope is sent to the Royal Society. 1672: Elected a Fellow of the Royal Society of London. His first letter on light and colours is read out by the Royal Society and harshly criticised by Robert Hooke, the Curator of Experiments there. (February 8th) His letter is published in the “Philosophical Transactions of the Royal Society” and becomes arguably the first scientific paper ever published. 1675: Newton attends his first meetings of the Royal Society where he meets Robert Boyle. (December) His hypothesis on the properties of light is reads to the Society. 1676: “Discourse of Observations” read to the Society. 1679: Death of Newton’s mother and he spends much of the year at Woolsthorpe. (November) Corresponds with Hooke on planetary motion. 1682: Newton observes Halley’s Comet. 1684: Series of Coffee House meetings between Newton, Hooke and Christopher Wren on the motions of the earth and the problem of the inverse square relation. (August) Meets up with Halley at Cambridge. Begins work on his famous book “Principia”. He demonstrated to the world that the force of gravity between two bodies such as the sun and the earth is directly proportional to the product of the masses of such bodies and inversely proportional to the square of the distance between them. 1686: Book one of “Principia” is presented to the Royal Society in which he states his three laws of motion. Halley instructs the Society to publish it. 1687: Newton begins lecturing on “De Mundi Dystemate”. 1689: Meets the philosopher John Locke for the first time. 1691: Newton visits Locke at Oates. 1692: Attends the funeral in London of Robert Boyle. 1693: Newton suffers a nervous breakdown which is illustrated in his letters to Locke and Samuel Pepys. 1694: He visits John Flamstead at Greenwich. 1696: Newton is offered a post of Warden of the Royal Mint and he departs Cambridge for London where he lives in Jermyn Street. 1699: He is elected Foreign Associate of the Academie Des Sciences in Paris. Elected to the Council of the Royal Society of London. 1700: Newton appointed Master of the Mint. 1701: Newton elected as a Member of Parliament by the Cambridge Senate and resigns his chair as Lucasian Professor of mathematics. 1703: Death of Robert Hooke. 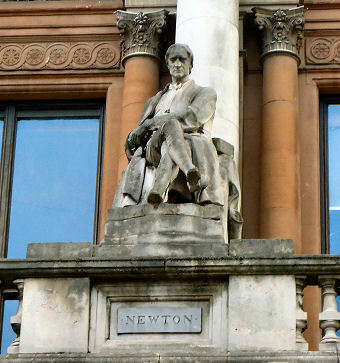 Newton is elected President of the Royal Society. 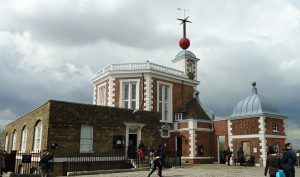 1705: He recommends publication of the Observations by John Flamstead the Royal Astronomer at Greenwich. 1705: Knighted by Queen Anne in Cambridge on 16th April. 1709: He moves to a new house in Chelsea, London. 1710: Newton moves to a new house in St Martin’s Street. 1712: A committee is established to examine the priority dispute between Newton and the german philosopher Leibniz on who first had ideas on a universal differential calculus. 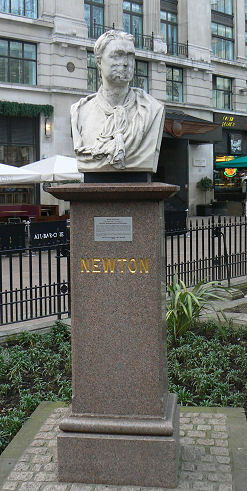 1722: Newton moves to Kensington, London. 1727: He attends the Royal Society for the last time on 2nd March due to his failing health. He dies on 20th March and then is lain in State at Westminster Abbey on the 28th and buried there on 4th April. 20th March 1727, Kensington, London, England. 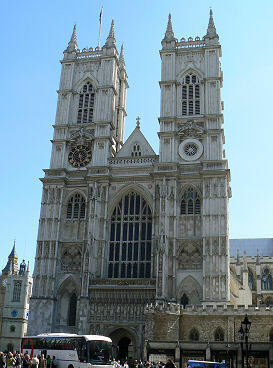 Nave, Westminster Abbey, London, England. Grantham Museum, St Peters Hill, Grantham, NG31 6PY. 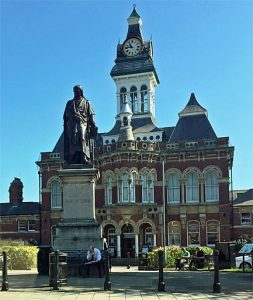 Statue outside Town Hall, Grantham. Woolsthorpe Manor, 23 Newton Way, Woolsthorpe. An example of Isaac Newton’s handwriting can be seen at the Journal Shop website here.